I would like to first thank each of you for your continued prayers and support for this ministry and our family. Although we go through different seasons of life and ministry, the goal is still the same. Preach the Gospel, and make Christ known in every place the Lords may have us. We are certainly approaching a new season ourselves. Trinity is graduating high school and will be 18 next month. She plans to go back to the States in the Summer. Her plans are to begin studying to become a nurse, but first she will go back and work for a few months before heading to Indonesia, Lord willing. She will serve a missionary family there who are both nurses and have a ministry in the jungle. The plan so far is to stay for five months, from December of this year until April of next year. She still has quite a bit to raise, but Lord willing she will meet her goal and learn a great deal about what she wants to do with her life serving the Lord. You can find the fundraiser on Youcaring.com under “Trinity serving in Papua Indonesia” and there is a link at the bottom of this letter as well. Please pray about helping. We also will be focusing most of our time and energy on a new work. Some of you may have heard about the small christian school I am serving at during the week. The owners live in Florida, but sought me ought to evangelize the children, their parents, the teachers (yes, the teachers too), and the surrounding community of San Jose Las Minas. 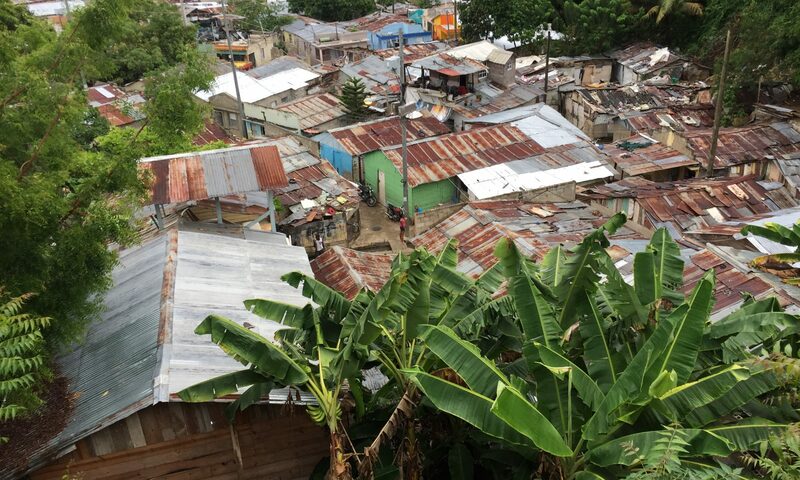 The school sits just above an area called the hole (one of about four in this city) that is drug and crime infested with many people living in extreme poverty. Some of the children who attend that school live there, and most of the others live nearby. It is going well so far but very much a challenge on many different levels. Right now there is a bible study open to the teachers, students and neighbors on Tuesday nights. But we still have much work to do in evangelizing the area. Please pray for this endeavor, that God may be glorified through people who presently have no hope in receiving Christ and being transformed through the power of the Gospel. As we begin focusing more of our efforts in the new area, I will certainly be in a somewhat different role for a season. Much more evangelistic for a while and a little less pastoral. But still teaching and discipling this new group of people as this work grows. Please pray for the much planning, footwork and resources needed to be effective in saturating this area with the Gospel, bibles and other helpful literature. Pray for the Lord to raise up others to join us in the work as well. Last month we had the privilege of hosting some wonderful brothers who visited to teach a four day conference. Brothers Steve Atkerson and Dan Trotter have experience in church planting and teaching in countries all over the world. We held part of the conference here in Santiago and the other part with Pastor Jose in Boruco with members from four different churches. It was very edifying and I had the privilege of getting to know and translating for the brothers who did the teaching. It was also wonderful to see and spend some time with the brothers and sisters there that we haven’t seen for a while. Please pray for Christen as she has had some health issues recently with some pretty high blood pressure and headaches for several days. She is on some medication to get it under control for now, but we are still waiting on the results of her EKG and the many blood tests they ran. We will share the results and keep everyone updated. You can check our facebook page (Salgado DR Mission) for more frequent updates and prayer requests. Please remember to pray for the church in Hato Mayor and Pastor Jose who is still laboring in Esperanza, Boruco and Pierda Gorda. Pray for Trinity as she prepares to leave home, and for our family as we adjust to not having her here with us. Pray for her to meet her goal as well, and that the Lord would protect and use her during her time there in Indonesia. May God give us the strength and the grace to keep running the race and redeeming the time. Pray.